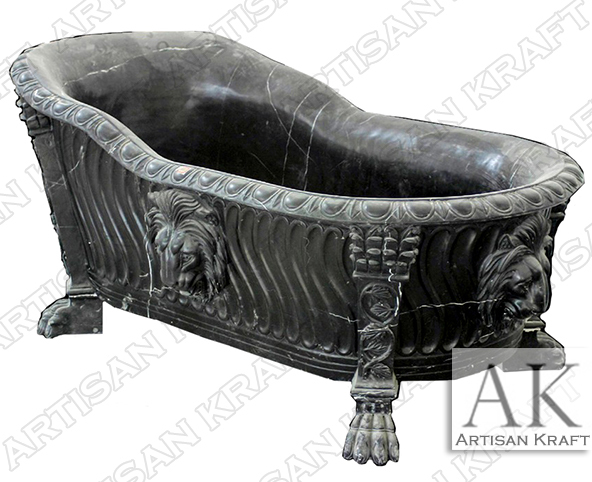 Carved from a solid block of stone, this luxurious Black Forest polished marble tub is grandiose. Lion heads and feet drape the sides of this perfectly designed center piece. Freestanding Tub can be ordered in custom size. Overflow drain and soaking side are additional upgrades. This black marble freestanding clawfoot bathtub is designed for an ultra luxurious master bathroom. Clawfoot freestanding bathtubs made from marble or copper are great for spas. Get a beautiful matching free sink in the same stone for when you purchase.